Absolutely love this cabinet in my living room.... Found this piece over a year ago and searched high and low for something with similar height and look. Exactly as pictured. Looks great in a room with 12' ceilings and is definitely an eye catcher.... Delivery was very professional. Standing tall and impressive, this reclaimed wood cabinet has rustic charm with a touch of industrial flare. Weathered, reclaimed oak is as sturdy as it is gorgeous, with four ample shelves and a lower drawer. 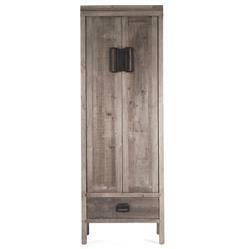 The artisan-crafted cabinet makes a handsome wardrobe, linen closet or armoire accenting any decor.